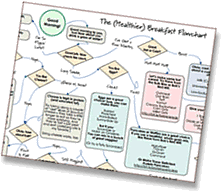 It’s the end of October and you are probably thrilled that you survived October Unprocessed. Survived? Heck you probably thrived during this month, making more food at home, watching what you eat, and realizing that not only is unprocessed food better for you but it’s also been fun! But the end of October comes one holiday where unprocessed food is hard to avoid – Halloween. Or is it? Why can’t you have a fabulous sweet filled Halloween, one that would make your kids smile with sweet happiness, while still being completely unprocessed? 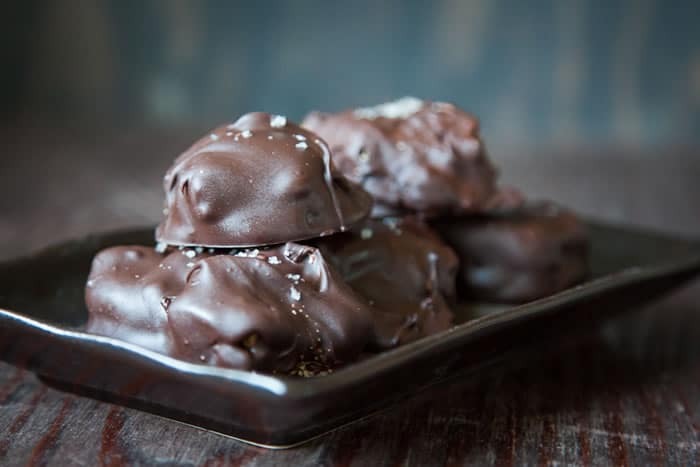 Make these completely unprocessed maple peanut nougat chocolate clusters and prove to everyone that you can have your treat without any tricks! Now I’m not going to lie. These treats have scant nutritional value. There’s not hidden kale or secret quinoa in them. Sure you can pretend that the dark chocolate you enrobe the candies in is fully of anti-oxidants but you’re pretty much just trying to justify the fact that you’re eating candy. The reality is that this treat is a sugary treat, plain and simple. BUT it does follow the rules of October Unprocessed, in that every ingredient is utterly pronounceable. In fact it passes the kitchen test in that every ingredient can be made in the kitchen, including the chocolate. In truth, after a month of eating unprocessed, you (and your family) deserve a sweet ending. Happy Halloween everyone and Happy October Unprocessed! Until next year! There are a number of relatively unprocessed and raw chocolates out there. Do your research and find the one that you are comfortable with and when in doubt, check the ingredients list and look for ones with minimal ingredients (preferably one that doesn’t have lecithin in it, an emulsifier that probably doesn’t qualify for the “unprocessed” tag). You can use any nut butter (your own homemade kind or a quality store-bought one) and your own choice of nuts in this cluster, but I went old school with the peanuts because I thought they were a classic flavor. I did use two whole vanilla beans in this recipe. I know vanilla beans are expensive but I was trying to keep it to whole ingredients as much as possible. If you don’t want to splurge on two beans, just substitute in 2 teaspoons of vanilla extract in place of each bean. Finally, though it probably goes without saying, don’t use pancake syrup, but use real maple syrup. But you already knew that, right? Coat a 9 x 9 inch baking pan with cooking oil and line with a piece of parchment paper. Coat the parchment paper as well with oil. Place the egg whites and sea salt in the bowl of standing mixer fitted with a whisk attachment. Place the maple syrup in the medium-sized pan, with the candy thermometer clipped to the side. Make sure the thermometer isn’t touching the bottom of the pan (that can give you a false reading). Turn the heat to medium high and carefully monitor the pan until the maple syrup starts to boil. Turn the heat to medium low and start to stir constantly with a heatproof spatula, to make sure the maple syrup doesn’t boil over. Cook the syrup until it reaches about 260 F, then turn the mixer on to high to whip the eggs. Paying attention to the mixer (and the maple syrup as you don’t want it to boil over) whip the egg whites until soft peaks form. Turn the mixer off and continue to cook the syrup until it reaches 275 F. Turn the heat off, and turn the mixer back on to high speed. Slowly drizzle the hot maple syrup down the side of the bowl, into the egg whites. Don’t pour too fast, or pour in the middle of the bowl, as the whisk attachment will whip the syrup onto the side of the pan and it will immediately harden. Continue until you’ve incorporated all the syrup. Continue to whip the egg whites until the nougat starts to clump together and get sticky in the middle of the whisk attachment, about three minutes or so. While it’s whipping, split the vanilla bean lengthwise and scrape the seeds into the nougat. Once the nougat starts to clump up in the middle of the whisk, turn the mixer off and add the peanut butter, one tablespoon at a time, folding it in with a large spatula by hand. Once you’ve incorporated the peanut butter, the nougat should look fluffy and thick. Scrape into the prepared pan and spread to cover the entire bottom of the pan with the offset spatula (you can also just use a butter knife). Let the nougat cool a bit while you make the peanut candy crunch by placing the maple syrup, heavy cream, butter and salt in a clean medium-sized pan with the candy thermometer clipped to the side. Turn the heat to medium high and carefully monitor the pan until the liquid starts to boil. Turn the heat to medium and start to stir constantly with a heatproof spatula to make sure the maple syrup doesn’t boil over. Cook until the candy reaches 250 F. Turn the heat off, split the vanilla bean lengthwise and scrape the seeds into the candy and then add the chopped peanuts. Stir to mix in the vanilla and peanuts and then pour over the nougat. Immediately spread with an offset spatula (or butter knife) to cover the nougat. Sprinkle the vanilla salt over the candy. Let cool for 30 minutes then refrigerate (uncovered) for four hours or overnight. Once the candy filling has been refrigerated, line a baking sheet with a silpat or piece of parchment paper. Chop the chocolate into 1/2 inch chunks and microwave for a minute at high and stir. Microwave for another minute and stir again. Microwave for 30 second intervals, stirring in between until the chocolate is melted. 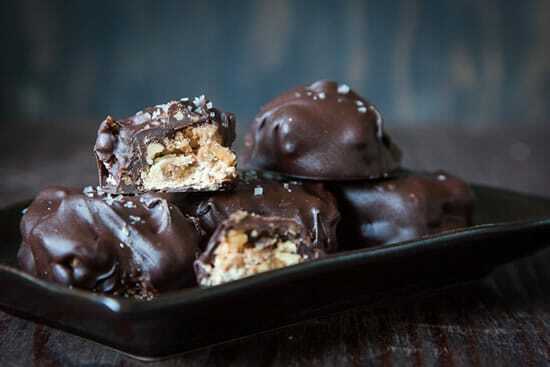 While the chocolate is melting, take the candy filling out of the refrigerator and lift the filling out of the pan by grabbing the parchment paper and lifting up. Move to a cutting board and cut the filling into 1 1/2 inch squares (a 6 x 6 grid). One the chocolate is melted (don’t over heat the chocolate) using a fork, dip the square into the chocolate and wipe the excess chocolate off the sides. Move to chocolate candy to the lined baking sheet and repeat with the remaining filling. Once done, sprinkle a tiny pinch of vanilla salt over the chocolates and refrigerate until hard (about an hour). Enjoy! Yep! Most people don’t realize that nougat is totally doable at home. And yes commercially it is probably made with HFCS, but the nice thing about making it at home is that you can control what goes in it. I worked with maple syrup because it’s unprocessed, but most recipes at home call for white cane sugar and a little regular corn syrup. You can swap out the corn syrup for honey if you go that route. i had no idea that you could make nougat at home either. how very intriging and i would be interested in trying but my mixer doesn’t have a whip attachment. it is just a beatable old hand mixer – can one do it w/ that? Wow!! These sound amazing. Maybe there’s still time to make these before tonight. I’ll admit they are a bit time consuming to make because you have to let them chill in the fridge… BUT totally worth it! I kinda want to jump up and make these right now, Irvin. Thanks for giving us an amazing alternative to all the crappy-crap candy out there. YUM! Is there a trick to pouring the hot maple syrup down the side of the bowl, since tipping the stand mixer isn’t doable? Also, can you recommend a good candy thermometer?